If you're heading to Las Vegas this summer — or any other place where you'll be cramming a lot of poker into a limited period of time — you may well face situations when you want to stay up late. There's nothing wrong with playing long sessions deep into the night. It's often part of the game, such as those times when you're seeking to take advantage of a great game. In those situations, when the game is really, really good, you'll want to pry your eyes open with toothpicks if necessary to keep in the game. Even so, playing tired is often a recipe for disaster. The problem is compounded by the fact that it's often difficult to tell when you are too tired to play. It's like drinking and driving. Some drivers actually claim that they drive better when they've had something to drink. This is surely wrong, as their reaction time and judgment are impaired. But because they're so impaired, drivers often mistakenly think they're driving better, because they feel better about their driving when they are intoxicated. Being extremely weary is much like that as the sensors of weariness are themselves disabled by being tired. There is an inertia of rest that keeps players who are fatigued from getting up and leaving. They are "stuck" to their chairs, as it were, and without realizing it make mistakes of passivity and inattention as the hours pass until and after dawn. With that in mind, I've assembled a list of warning signs of extreme fatigue. Some are obvious, some less so. Few things are absolute in poker, including this list. But recognize that if you have three or more of these symptoms, you should probably leave the table and not return until you've grabbed some serious z's. Sure, people yawn all the time. But I'm talking about repeated, uncontrollable yawning — a couple or more times every few minutes. This is a very reliable indicator of severe tiredness. Smoke and eye irritation can cause this. But it is also a symptom of being extremely tired. It's especially telling if you're blinking a lot and yawning (even as you say to yourself that you're fine). When you're not tired, you'll move your eyes. They'll dart effortlessly from object to object. When you're extremely tired however, your eyes don't move as effortlessly, and you find you need to turn your head or torso to look around. Some people slouch habitually no matter how tired they are. But those of you who typically sit up straight at the poker table may find that you are slouching when you are tired. Be especially concerned if you're literally resting your chin on your hand or putting your head on your arms. Are you quick to pick up on the server asking if you want a drink? Are you remembering where the action began and who raised? Or do you find yourself not keeping track of the obvious details of a hand, acting out of turn, and otherwise "spacing out"? If it's the latter, chances are you are extremely tired. Sure, we all stare from time to time. But when we're tired we tend to keep our eyes on objects longer. That's because it takes some effort to move the eyes. When you're really tired, you tend not to make any more effort than you need to. Your head weighs about 20 pounds. Typically, supporting it is natural and easy. But as fatigue sets in, the neck and shoulder muscles begin to feel the burden of carrying that weight, making the head feel heavy and sometimes resulting in the desire to rest your head on your hand or on your arm. When you notice the weight of your head at the poker table, that means that you are extremely tired. New and otherwise unskilled players regularly have to recheck their hole cards, not having developed the habit and skill of remembering them. Once you get into the habit, remembering them is easy and, typically, automatic. But when you're tired, even if you typically remember them once you look at them, you begin to forget them, requiring occasional rechecks. The thought itself is never induced by anything other than weariness. No one who is well rested and alert thinks, "I wonder if I'm too tired to play." So if you think you might be tired, you almost surely are, and should seriously think about packing it in for the night. There is great satisfaction in closing your eyes when you're tired. Unless you're playing in an extremely smoky room, there's really nothing other than weariness that causes the desire to close your eyes. Blurry vision is a symptom of fatigue. Sometimes, especially while driving, people shake their head vigorously back and forth to "clear out the cobwebs." 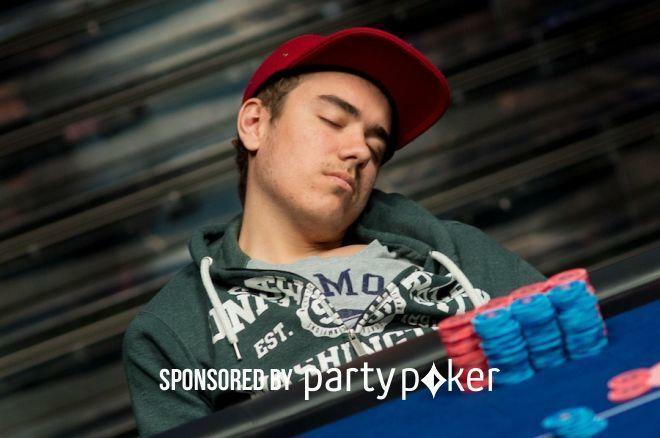 If you're doing this at the poker table, it's almost surely a sign that you need to get some sleep. Think back to when you woke up for the day. If you haven't taken any naps, and it was 18 or more hours ago when you woke up, that's a very strong indicator that you've been awake too damn long and need some sleep. Yes, there are times when you want to continue to play, even though you realize you are extremely fatigued. But more often than not, you are much better off calling it quits and coming back another time when you are well rested and thereby better equipped to take advantage of the mistakes of others. This strategy article by Ashley Adams for PokerNews is sponsored by partypoker.